Do you like dogs? Do you like running? This run's for YOU! Join us for a 3ish mile fun run with an adoptable running buddy and The Monster Milers the second Sunday of every month starting from Philadelphia Runner Center City at 10:30AM. Post run, enjoy 15% off your purchases back in the store! These events are opened to the public and strictly social. All who are interested are welcome to participate. There is no need to be a current or even future Monster Miler volunteer. We just want the chance to get together with other Milers, some rad Philly runners, and help to exercise and showcase an adoptable running buddy from one of our shelter partners to participating runners and potential adopters as we make our way through the city. If you cannot make it to our Sunday runs, just check on our FB events schedule to make sure there haven't been any changes due to scheduling conflicts. Not familiar with The Monster Milers? 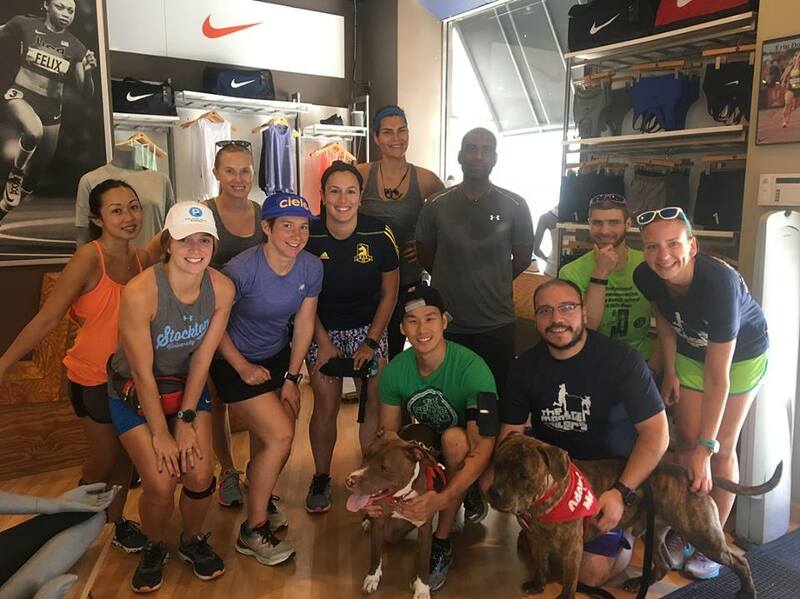 We are a group of volunteer runners trained to take shelter dogs throughout the city out for runs, getting them out of the kennel and shelter environment and helping to keep them mentally and physically healthy while awaiting their forever families! If you have questions about other Monster Miler Events or how to get more deeply involved in our volunteer programs, check us out on FB (facebook.com/themonstermilers), at our website (www.themonstermilers.org) OR email info@themonstermilers.org! Get going and flowing with a run to yoga! Meet in our Center City shop at 9:00AM for a 30 minute group run around the city followed by a dynamic 45-minute flow yoga to stretch out while our bodies are warm. This yoga practice, led by Focus Barre & Yoga instructor, Melissa, will include breathe work to increase lung capacity. You will be lead through a series of postures to stretch the muscles of the feet, legs, back and shoulders and strengthen muscles surrounding the joints including the ankles, knees, hips, shoulders and wrists. Challenge your balance and center your mind to enhance endurance and stamina. Class will end in gentle, sweet relaxation! The run and yoga are free and all are welcome to join! BYO mat! An overnight running relay? In the woods? Some call it crazy. We call it Ragnar! Join us on Thursday, May 29th for all the details on Ragnar Trail Wawayanda Lake. We'll have Q&A, a raffle and snacks! You'll leave feeling ready to Ragnar. Because questionable decisions make the best stories. Bonus! Use the code PHILLYRUNNER to take $80 off registration for the Ragnar Trail Wawayanda*. Click here to sign up! *Code must be used during registration, may not be applied retroactively or combined with other offers. Excludes high school or black loop teams. You don't have to run a marathon to drink this beer. We're heading on a 3ish mile run starting at 6PM in our Center City shop and ending at Field House (1150 Filbert Street) to rehydrate with 26.2 Brew, the official beer of the Blue Cross Broad Street Run, from Marathon Brewing Co. Your first beer is free! The 5th Police District is joining our Manayunk Group Run on Thursday, April 11th at 6:30PM! We'll head out for a 3 - 5 mile run ending with refreshments and refreshing conversation back in our shop on Main Street. Bring your friends and your questions, comments and concerns! This is a FREE event. All paces and faces are welcome! Similar to a Scavenger Hunt, participants will have 1 hour to safely run or walk to up to 12 predetermined locations in order to receive raffle tickets for over a dozen prizes! The Urban Scramble is a fun run and is not a race, however the more raffle tickets you get receive, the better your chances so be sure to arrive to the store a few minutes early to receive the list of destinations and plot your strategy! We will begin at 6PM sharp from our Center City store at 1601 Sansom St. Please note! We will not be ending at the store so please only bring what you can carry on the run including your ID! This event is free to sign up but you must register, click HERE to sign up! Workshop starts at 10AM in Phila Massages Manayunk location. We're brewing with excitement over this run! Add some hop to your miles with us on Thursday, April 4th! We're heading out for a 3 - 5 mile run ending with a post run hoppy hour to try out the new Hoppy Trails Gu flavor. That's right - now you can carry a beer in your pocket to enjoy on the run (minus the buzz). We'll have some adult beverages too along with some free swag and prizes. Meet in our shop on Main Street in Manayunk - the fun starts at 6:30PM! You may have heard somewhere along the way that less is more but this time around: More is More. Introducing the New Balance More. Featuring the most advanced Fresh Foam cushioning yet, the More is made softer to go further. Celebrate the More's arrival on Monday, April 1st in our Center City shop. We'll head out for a 3ish mile run ending at the store with a no shower happy hour, raffles, shopping specials and MORE! More miles. More comfort. More! Join Girls on the Run Philadelphia for a group run + info session in our Center City shop on Thursday, March 28th! We'll head out for a 3ish mile run followed by a short info session to learn more about their positive youth development program for 3rd – 8th grade girls in Philadelphia and how to run your next race as a SoleMate! Oh and did we mention snacks? Refuel and rehydrate: Sip-N-Glo Juicery Sansom will be pouring samples of deliciousness in our shop post run!